Fish and land flora diversify. Amphibians and insects appear in the fauna. The Caledonian mountain chain, as high as the Himalayas, starts to erode. Thick fluvial deposits cover southern Finland. The Scandinavian Mountains, Scottish highlands and the Appalachian Mountains are remnants of the Caledonian mountain chain. At warm and moist climate vascular plants diversified. True roots and leaves evolved. Gradually terrain was covered by flourishing forests of lycophytes, ferns and horsetails. Trees grow up to 30 meters high. At late part of the period also the first seed plants appeared. Devonian is often called as ”The age of fish”. 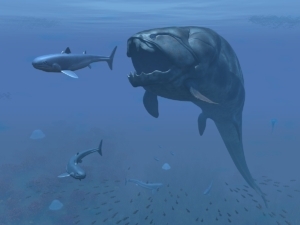 Oceans were dominated by various ’armed fish’ or Placoderms. The largests of them, Duncleosteus, grew up to 6 m long. 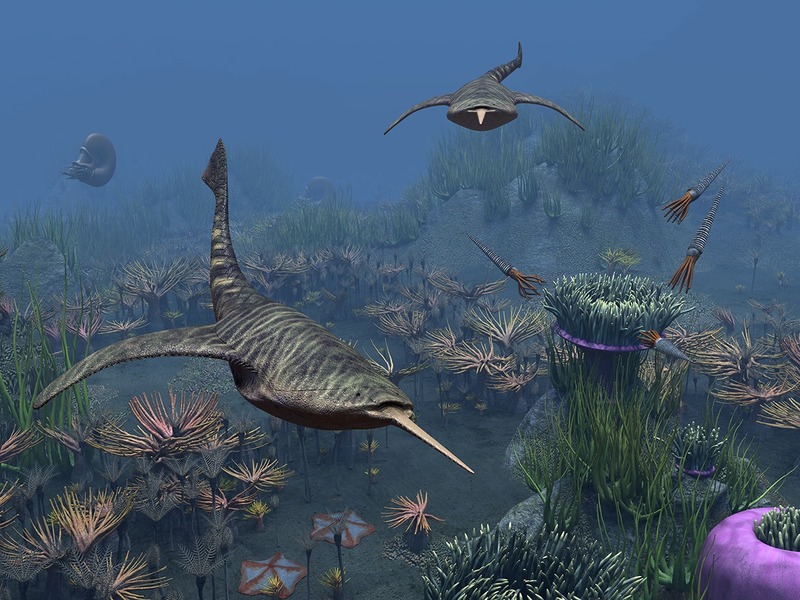 Also the first cartilaginous fishes, the progenitors of sharks and rays, had evolved allready at Silurian, but their heyday started after Placoderms went extinct. The first ray-finned and lobe-finned fishes evolved at fresh water systems. The ray-finned fishes is now the most species rich vertebrate group. 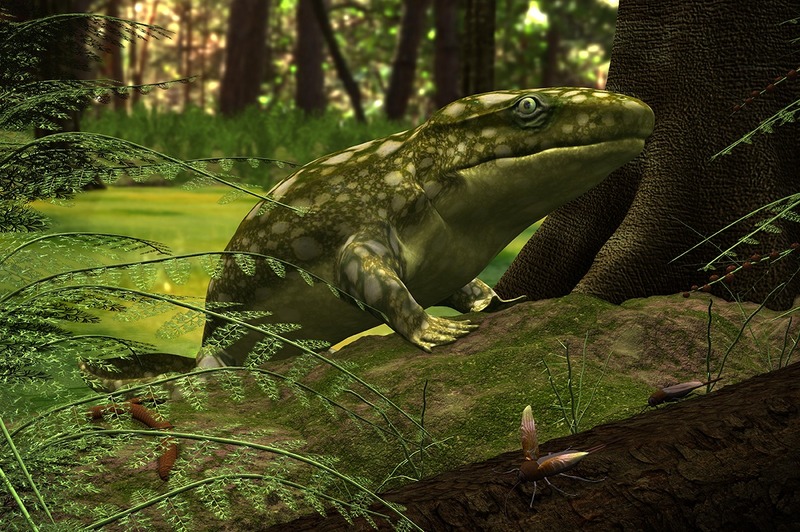 The first land vertebrates evolved from lobe-finned fishes at the late Devonian. One of the most famous transitional fossile between fishes and amphibians is Tiktaalik, which was found 2006. Also insects and spiders evolved and started to colonize the land. Life was taking over the land. The Caledonian mountain chain, as high as the present day Alps, starts to erode. Thick fluvial deposits cover southern Finland and the North Western Europe. The Scandinavian Mountains, Scottish highlands and the Appalachian Mountains are remnants of the Caledonian mountain chain.